This 2 light vanity highlights white frosted glass shades to match transitional dicor. The vanity bar can be mounted up or down to suit your personal style. The fixture is finished in brushed nickel which matches most home styles. Requires 2 - 60 watt medium bulbs. 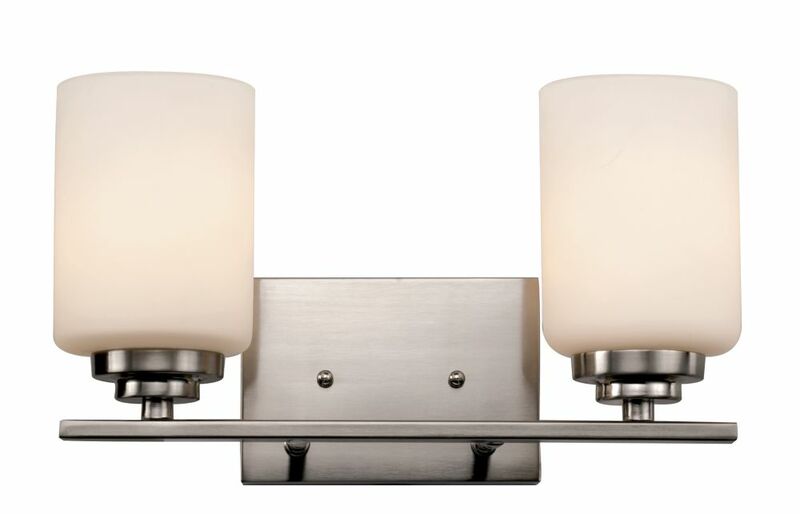 The Hampton Bay 4-Light Brushed Nickel Vanity Light adds chic style to your bath bar. The fixture provides focused lighting that is ideal for makeup and grooming tasks. The light features a square back plate that allows for mounting to the wall or ceiling, a perfect accent to your décor. 2- Light 60W Brushed Nickel Vanity Light This 2 light vanity highlights white frosted glass shades to match transitional dicor. The vanity bar can be mounted up or down to suit your personal style. The fixture is finished in brushed nickel which matches most home styles.